GULFPORT, MS, June 8, PR Newswire, Linear Power Ltd.’s Founder, Robert Hunt, appeared before the Saint Bernard Parish Council in LA during their session on June 4th and before the Harrison County Board of Supervisors in MS yesterday to put forth his plan to use strong magnets to stop the leaking oil. The Harrison County Board passed a resolution directed to BP, the Coast Guard, and the President requesting that they take immediate action upon ideas submitted to find a solution to the leaking BP Deepwater Horizon Oil Well by experts like Hunt. Wayne Landry of Saint Bernard Parish confirmed that his council plans to pass a similar resolution. Hunt who is a former nuclear engineer that designed reactor components for the USS Nimitz and who currently reworks deep oil and gas wells to convert them into long life geothermal power plants maintains that BP is not doing everything that it can do to stop the oil spill. “There are a lot of smart people around that can help find a solution, but BP isn’t really searching in earnest for an outside solution. They want to do it themselves and are afraid that if someone else gets credit for a solution that it will make them look bad,” Hunt said. “What they are not realizing is that BP is looking worse every day this goes on. I am not going to let it go until the leak stops.” Apparently Landry feels the same way as Robert he plans to meet with Governor Bobby Jindal today to discuss Hunt’s solution. The magnetic top kill idea that Hunt and co-worker George Reed came up with uses concrete that is made using pieces of magnetic metal instead of rocks. 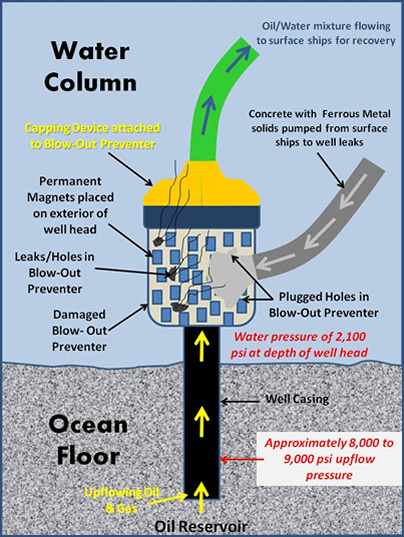 Powerful permanent magnets that are unaffected by depth are placed on the outside the casing of the well at the leaks where they attract the metallic solids in the concrete and draw it to where it is needed and where it is held in place by the powerful magnetic field in order to overcome the pressure of the oil. “If at the start of the top kill process had BP listened and employed our magnetic top kill method, there would be no leaking oil today”, Hunt declared. Graphics of the magnetic top kill process may be seen at the Hunt affiliated websites below. Linear Power, Ltd. is a leader in the conversion of deep abandoned oil and gas wells into long-life geothermal power plants, often using wells over 20,000 feet of depth where the temperature approaches 400 deg. F. The company designs and builds a proprietary line of long-stoke, free-piston engines and permanent magnet linear alternators. Operations extend from Florida to California. The company is privately held by Robert Hunt. Posted on June 10, 2010, 11:39 pm, under News, Projects.